Robert Kilwardby (d.1279) was an English scholar who lectured on logic and grammar at the University of Paris in the 1230s. His lectures earned him widespread fame in Europe. Throughout the thirteenth century and up to the sixteenth, Kilwardby's lectures on Aristotle's Prior Analytics were considered to contain the authoritative exposition of Aristotle's syllogistic logic. They were published at Venice in 1499. 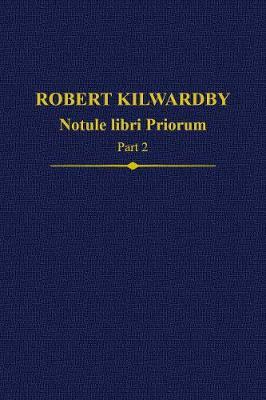 Written in the heady atmosphere of the early 1200s, when long-forgotten Aristotelian works were being rediscovered, Kilwardby's commentary is the work of a penetrating philosophical intellect intent not only on understanding Aristotle's logic but on pushing it to its limits. The present edition, in two volumes, contains the first critical edition of the lectures, together with an English translation. Part 1 contains an extensive introduction, placing Kilwardby's work within its historical context and demonstrating its importance both as an exposition of Aristotle's text and as an original contribution to philosophical logic. It also contains Lectures 1-38. Part 2 contains Lectures 39-77 and the comprehensive indexes.